I'm thrilled to announce that my new book, Beat By Beat: A Cheat Sheet for Screenwriters, will be available nationwide Aug 1. It's written for screenwriters by a pro screenwriter, featuring story insights never published before--revelations that address character and structure issues screenwriters have been struggling with for decades. My last book Something Startling Happens was a bestseller and has been used by scriptwriters all over the world. This new book, however, is the screenwriting guide I've searched my whole writing life for, but could never find--an accumulation of what I've learned from optioning and selling scripts, working with professional directors and producers, and analyzing over 400 successful films. Once in a while a book comes along that shakes up the world of storytelling with a new approach that brings fresh insights and techniques to the craft. SAVE THE CAT was like that, a game-changer, and now another work appears that has the same potential to open doors for a lot of scriptwriters. Todd Klick's BEAT BY BEAT walks the writer through the fine details of building a story and offers clear guidelines for producing compelling, page-turning fiction, filling many gaps in our body of knowledge about how great stories are made. Beat By Beat focuses on the #1 movies in the top six genres that meet these three criteria: a) They're financially successful (each grossed between $300 million to a billion dollars at the box office). b) They're rated 75% or higher by critics on rottentomatoes.com. 3) They're rated 80% or higher by audiences on rottentomatoes.com. In other words, they are successful on all fronts: with producers, financiers, critics and audiences. No more wondering what to write during those vast expanses between your Act Breaks. 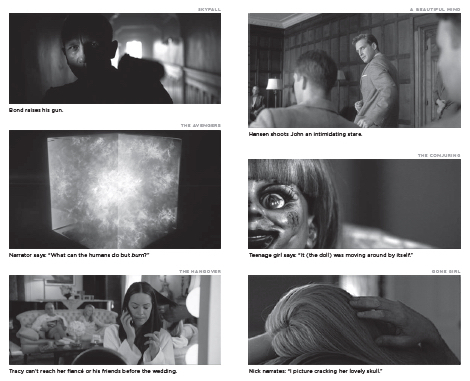 Beat By Beat walks you through the universal minute-by-minute benchmarks used in all successful movies, no matter what genre--crucial touchstones for each page of your screenplay. If you're ever struggling with structure or scene ideas for a certain section of your script, you simply turn to that minute in Beat By Beat to find the answer. Not only does Beat By Beat show--in a clean pictorial graph--the top 10 archetypes all successful movies use over and over, but it also reveals a common (newly unveiled) archetype many screenwriters miss, an important archetype called The Henchman. Beat By Beat describes, in easy, concise language, all the essential elements successful movie stories use, like: the Hero's Flaw, the Perfect Arc, Theme, and the true purposes behind Scenes and Dialogue. Accompanying these succinct explanations are visual aides that bring home their meanings. Beat By Beat discloses the exact minute (and why) the Inciting Incident occurs, by going to the ultimate source: successful movies. Beat By Beat explains how and why all Turning Points occur in popular movies, and reveals where they should happen in your script. As with many screenwriters, I've often found the traditional 3-Act structure limiting, especially when entering the extra-long Act 2. 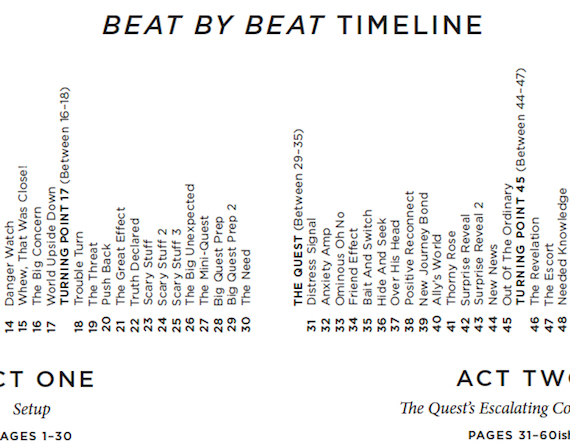 The 4-Act Structure in Beat By Beat, however--which many pros use--divides the story into more manageable chunks (even more so when you learn the minute-by-minute breakdowns within each Act). PRE ORDER BEAT BY BEAT NOW and get 20% OFF. 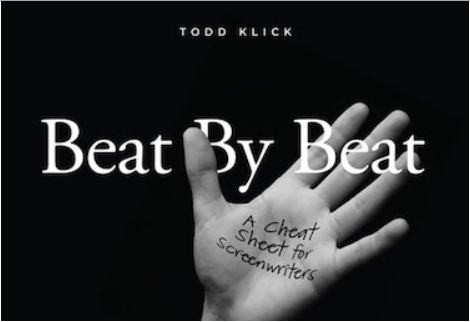 Todd Klick is the #1 bestselling author of Something Startling Happens: The 120 Story Beats Every Writer Needs to Know and Beat By Beat: A Cheat Sheet for Screenwriters. Todd is also a contributing author to the #1 bestselling Tarcher-Penguin book, Now Write! Science Fiction, Fantasy and Horror: Speculative Genre Exercises from Today's Best Writers and Teachers. Todd's stories earned accolades with the prestigious Nicholl Fellowship and the PAGE International screenwriting competitions. He has optioned and sold numerous scripts. Todd is a frequent speaker and panelist at writing conventions, contributor to The Huffington Post and MovieMaker Magazine, and has appeared on Dateline NBC and NPR to promote his work.